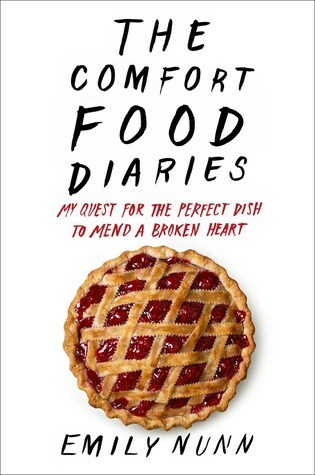 I started my BS Reading Project with Emily Nunn’s The Comfort Food Diaries because comfort is something that I have been actively seeking for a while. On its face, The Comfort Food Diaries is maybe not what I should have reached for to start this reading journey. The book starts with Nunn dealing with her brother’s suicide and soon after, her relationship with a man known only as “The Engineer” ends. He asked her to move out, so she was also without a real home. I feel better already. All of this information is dispensed very quickly, which seems like it should make for a really heavy first chapter, but it doesn’t. Not really. It is sad, but by the time she is writing about these things, she seems to have found a way to process and talk about them. By page 20, she had drunkenly posted about predicament on Facebook and received messages of kindness, love, and support. Friends offered to cook for her. Others offered a place to stay. A few graciously and affectionately offered to let her cook for them. And at this point, I thought I knew what this book would be: a road trip to visit friends and eat their versions of comfort food. In some ways, I was wrong on both counts, and I think the book is better for it. First, Nunn unpacks the incredibly personal nature of comfort food. Letting people cook her what they consider comfort food could be educational in an academic sense, but it might not nourish her soul in the way that comfort food can sometimes do. When you are craving soup and a grilled cheese sandwich, but are presented with BBQ brisket or cake, the contrast between your idea of comfort and someone else’s has the potential to make you feel worse and Nunn wisely realized this before she began. So, the recipes (and, obviously, are there recipes) and meals presented in the book unfold in a more organic way as she meets up with people from her past who are happy to reconnect with her. This is the way southerners are. No one simply tells you something directly and then leaves it at that. Each conversation is loaded down with other conversations and extraneous information and inconsequential observations and non sequiturs…It is not entirely meaningless; it’s circular, a secret code you either learn to decipher or just not worry about too much. I love this because I have had thousands of conversations with strangers who disclosed way too much by way of telling you the thing you asked about. Or sometimes just as a way to say “hello.” I do it too. Sometimes I am aware of it and sometimes not. But circular is a good way of describing the way that Nunn keeps coming back at times to particular people and places that seem to truly offer comfort. And more than comfort, they offer unconditional love and friendship. It becomes clear over the course of the book that some of her key relationships offered highly conditional love. Sometimes she knows why she had displeased the other person, and sometimes she only knows they are displeased but not the cause or the remedy for it. There are plenty of memoirs where people write of nightmare childhoods. Before this book, I read Tara Westover’s Educated, but I could easily list many more. It is more unusual to me to read about a family where things are not violent, but still difficult in this quieter, oddly strained way. The thing I related to in Nunn’s journey to get back to her old self and to figure out how she has found herself repeating the same unsatisfying relationship patterns is how people who care about you will be more gracious than you expect and are willing to give more than you ever would feel comfortable asking for. Friends and family are so gracious, and she never seems to stop being overwhelmed by the things that they offer without the slightest thought or hesitation. This memoir turned out to be a great place to start. It is full of smooth, beautiful prose and a whole lotta butter, both of which can be very comforting. This entry was posted in BS Reads and tagged Bitter Southerner, Books, BS Books, BS Reading Project, Literary Atlanta, memoir, nonfiction, Reading project, Southern literature. Bookmark the permalink.